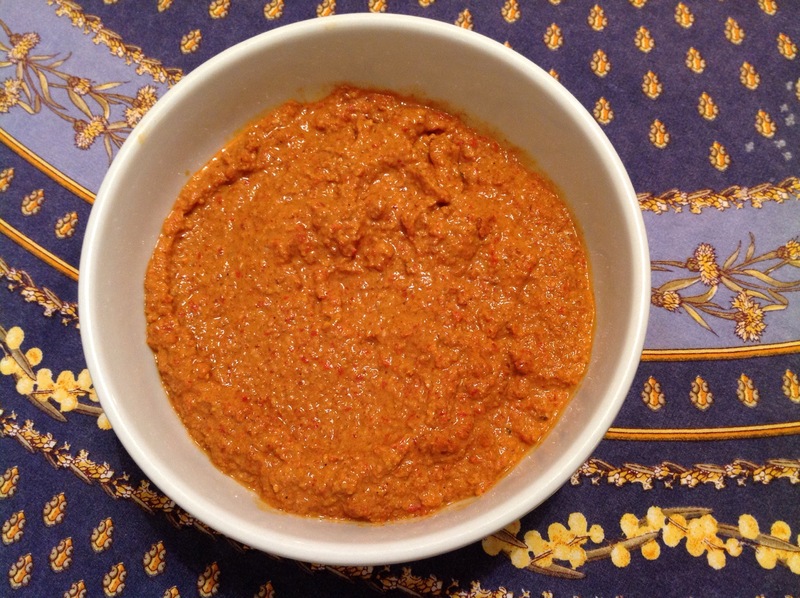 My husband has an Egyptian colleague who makes the most delicious Muhammara (red pepper and walnut dip) I’ve ever tasted. I have a family member who loves this dip but has recently developed a walnut allergy, so I have adapted Shereen’s recipe for Muhammara using pecans in place of the walnuts with very nice results. Place whole red bell peppers on a foil-lined baking sheet. Broil the peppers for about 20 minutes, turning occasionally until charred and soft. Remove from oven and let cool. Stem, peel and seed the peppers. Place roasted peppers in a food processor along with toasted nuts, olive oil and garlic. Pulse to blend ingredients. Add lemon juice, molasses, spices, salt and sugar. Pulse until you have a chunky dip. Taste and adjust salt and spices to your liking. Continue pulsing if you want a more smooth purée. Makes 3 cups. Serve with pita bread or Romaine lettuce. This entry was posted in Appetizers, Vegetables, Vegetarian. Bookmark the permalink.